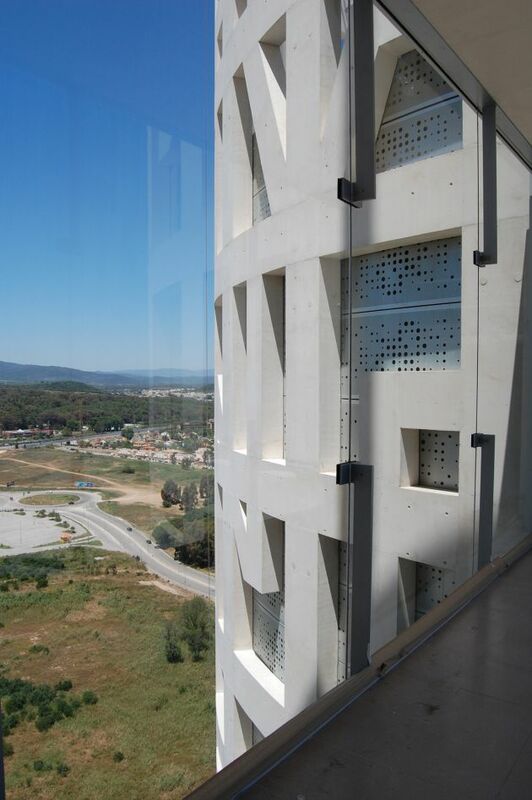 The Spanish architectural firm of Rafael de La-Hoz, have completed the Torres de Hercules. 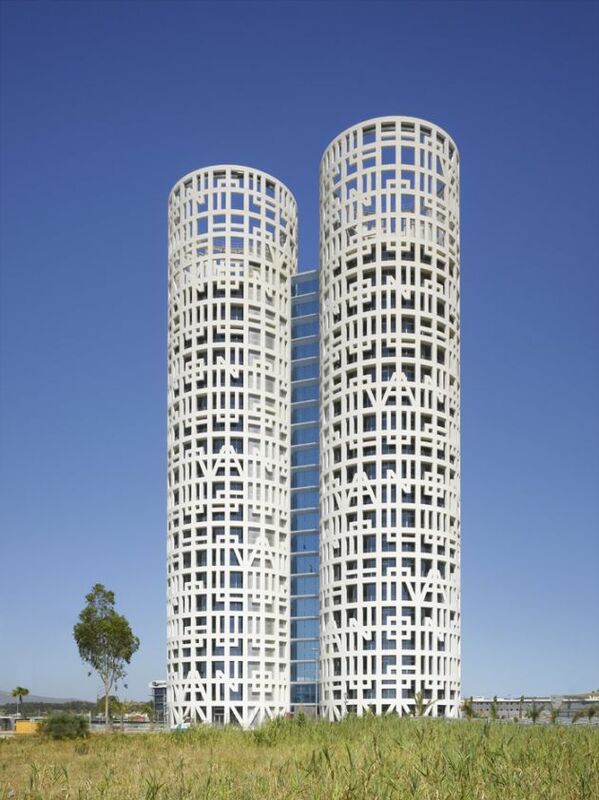 The two cylindrical white towers are located in the Bay of Algeciras in Southern Spain. 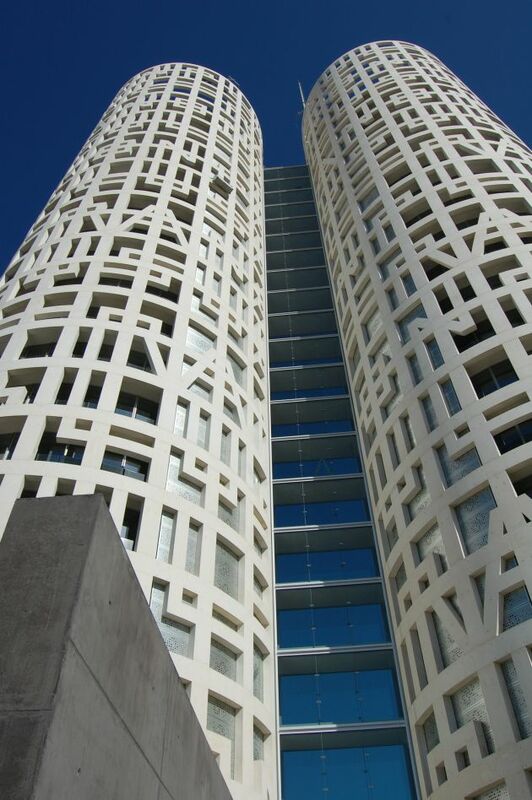 Architect Rafael de la Hoz completes the “Torres de Hercules” in Cadiz. They are a symbol of the legendary Pillars of Hercules and the tallest buildings in Andalusia. Two cylindrical, white towers rising from a flat pool of water. 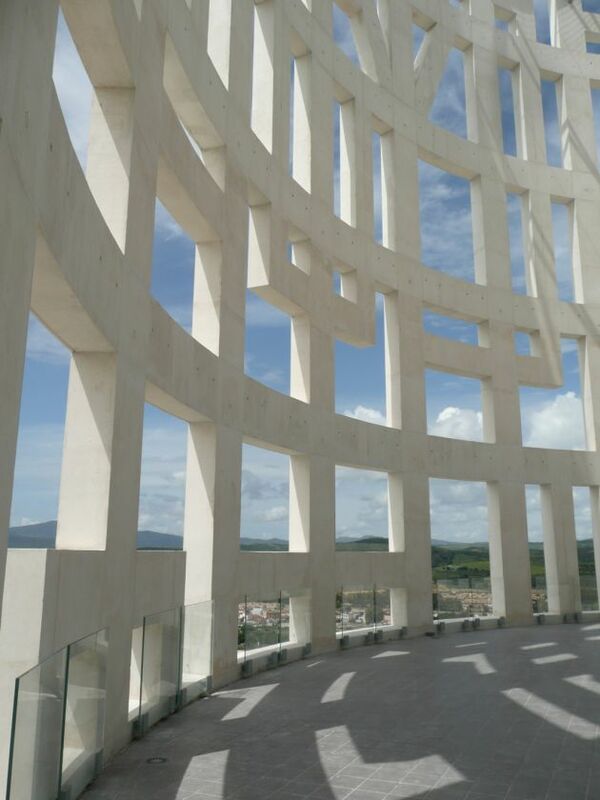 On the façade-a giant lattice-appears the mythical motto from the legend of the Pillars of Hercules, “Non Plus Ultra” (nothing further beyond), warning sailors in the Mediterranean of the edge of the known world. At a height of 126 meters, the “Torres de Hercules” rise up from the Bay of Algeciras, as a new benchmark in the Campo de Gibraltar and the transition of the Straight, as their uniqueness changes the area’s landscape. 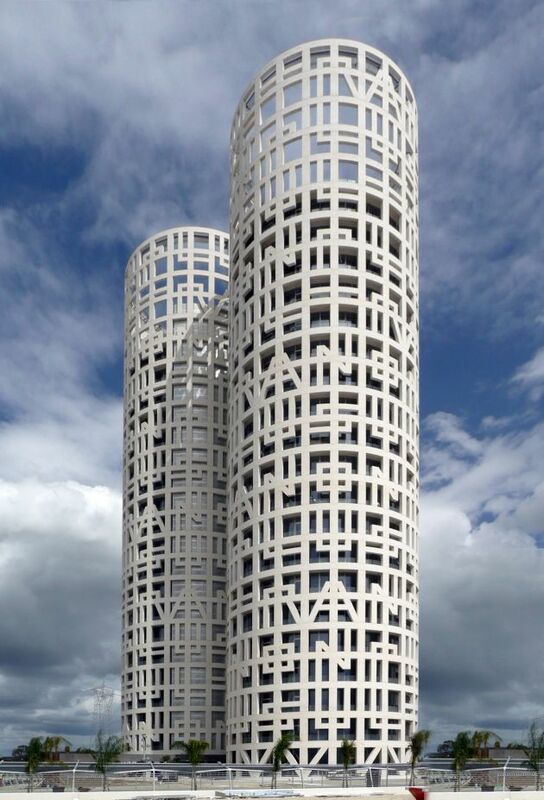 Located in the Bay of Algeciras (Cadiz) , the new construction, which is surrounded by a man-made lake, is comprised of two identical 20-storey cylindrical towers, joined by a crystalline prism which houses the hallways connecting the two buildings. Its outer appearance is configured by the structure of the building, a gigantic lattice which completely surrounds the perimeter. 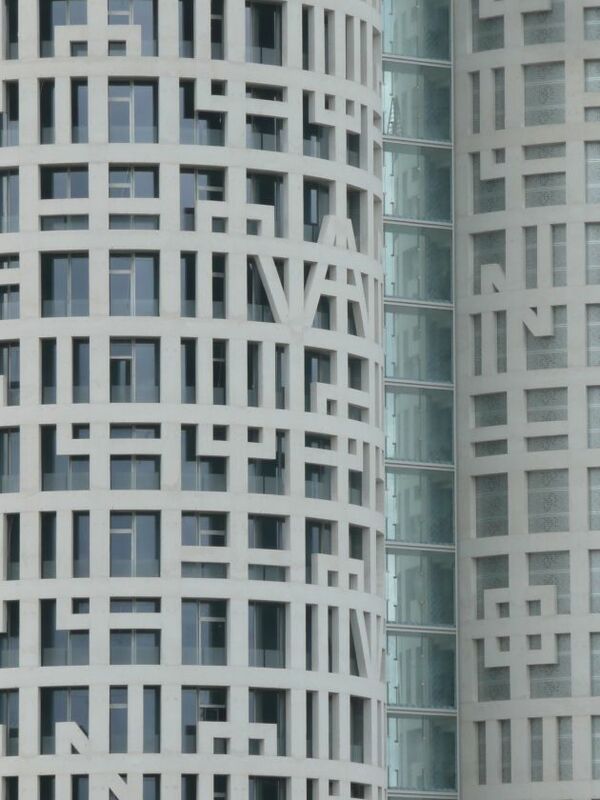 They contain the giant letters of the legend “Non Plus Ultra”. 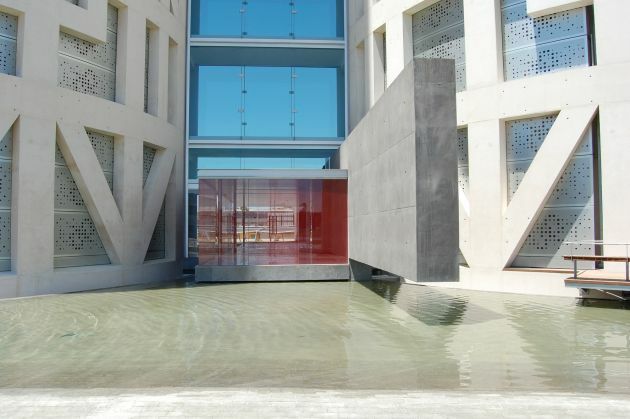 Their job is to protect the inside of the building from excess solar radiation while providing panoramic views of the Bay of Algeciras, the Rock of Gibraltar, and the Serrania. 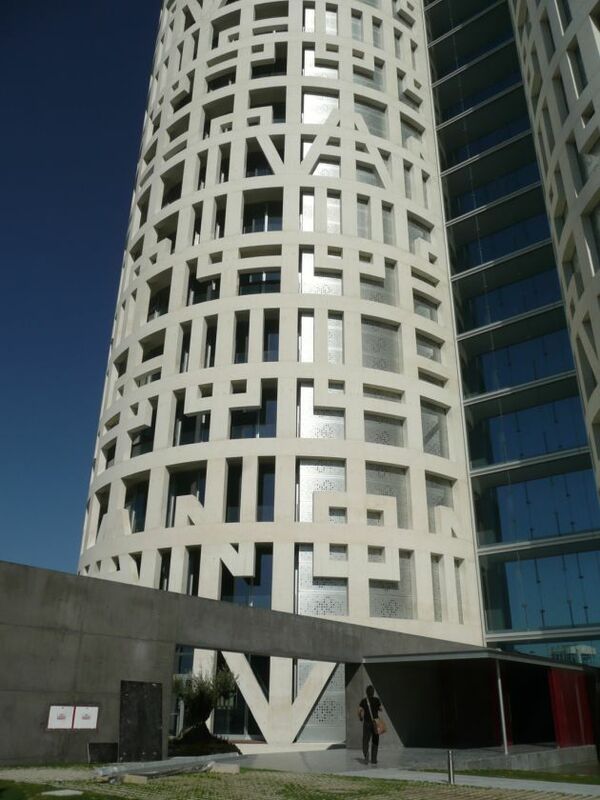 This grid extends past the building’s limits, as a “unique element” protecting the terrace roof-top deck, while at the same time acting as a base for possible energy collecting and telecommunications systems. 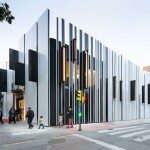 The project, with a total surface area of 19,000 square meters, was contracted by the Valcruz company of Cordoba. They will use the majority of the building for office space, although some of the floors will have commercial space and services, such as: coffee shops, bank branches, a travel agency, a messenger service, etc. On the top floor, 80 meters up, will be a lookout restaurant. 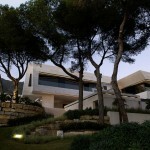 Above this, a panoramic roof-top deck will boast unique views over the Straight of Gibraltar, Mount Musa and the Alcornocales Natural Park. 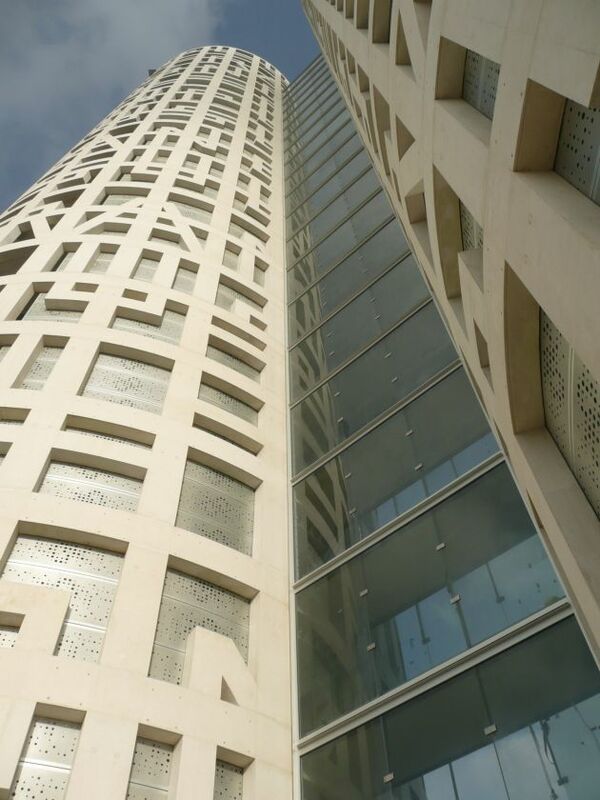 The building has a main entrance for pedestrians and cars which provides a clear view of the towers. The 200-spot ground-level parking lot is located on the other side of the towers and is organized around a landscaped area. The complex has a strategic location, which utilizes all of the region’s potential while at the same time being easily accessible. 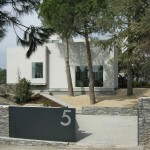 The objective is to take advantage of all of the possibilities offered by the Bay of Algeciras and the accessibility by the major motorways from Seville, Gibraltar, the Costa del Sol, and the Jerez de la Frontera airport. 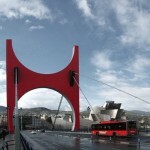 Visit the website of Rafael de La-Hoz – here.